The killer of a three-year-old girl has been given a fresh life sentence for trying to murder a woman while on release from prison. Stephen Chafer was 17 when he was jailed for life for sexually assaulting Lorraine Holt, 3, before knifing her to death in 1979. Forty years later, he has again been sentenced to life in prison – with a minimum term of 17 years – for the attempted murder of Fay Mills on 23 June last year. Chafer, now 57 and who was living under the pseudonym Stephen Leonard, launched a frenzied knife attack on the 60-year-old following a row over a garden rake. He was on release from prison on licence when he attempted the murder of Mrs Mills at her Peterborough home. Mrs Mills, who has dementia, was so badly injured that police believed she was already dead when they arrived at the scene of the attack. Chafer was convicted at trial last month, where he was also found guilty of the common assault of Mrs Mills’ neighbour Mark Patchett, who tried to help her. Appearing under his pseudonym, he was sentenced at Cambridge Crown Court on Friday. He also described Chafer as a “serious risk to members of the public and particularly women”. Mr Patchett, who previously served in the Armed Forces, described a scene “like a house of horrors… with blood everywhere” in a statement. He suffered a cut to this face as he confronted Chafer. Judge Farrell ruled £750 be awarded to Mr Patchett for his bravery. Mrs Mills’ survival of the attack was described as “frankly a miracle” by prosecutor Charles Falk. Her daughter, Sheila Mills, had been away on the weekend of the attack and believed her mother was in the care of a “close friend”. “She trusted Stephen with everything,” said Mr Falk, as he summarised a victim impact statement. Chafer found three-year-old Lorraine sitting in the snow in tears at her home in Derby, before he carried her to a nearby vicarage were he sexually assaulted her and stabbed her 39 times. Lorraine’s father, Jim Holt, has criticised the Parole Board for giving Chafer the chance to attempt a new killing. Chafer admitted Lorraine’s murder and was granted parole, after spending 23 years in prison, in 2002. In 2013, he was handed another prison sentence for torching his flat and risking the lives of other residents in the building. He was released again in 2017. A spokeswoman for the Parole Board said: “The Parole Board directed the release of Stephen Leonard following an oral hearing in July 2017. “Tragically, there are rare occasions when offenders go on to commit serious further offences after being released by the Parole Board. A child killer released from prison tried to decapitate a pensioner in a row about a garden rake, as it emerged the victims’ families criticised the Parole Board for freeing him. 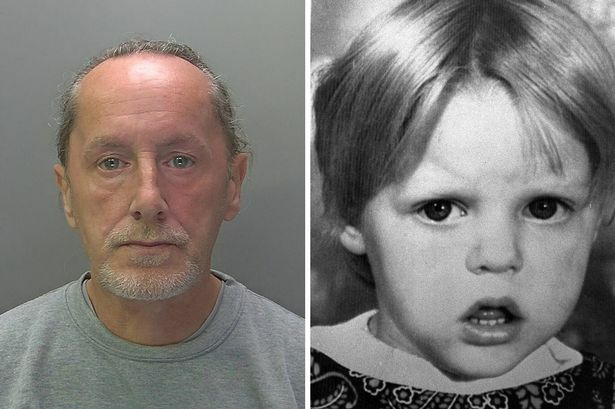 Stephen Chafer sexually assaulted and then stabbed to death three-year-old Lorraine Holt after finding her playing in the snow in her garden in Derby in 1979. He was then jailed for the murder and released from prison in 2002 before being again imprisoned in 2013 for arson but then released again on licence in 2017. In June this year, he went to the Peterborough home of Faye Mills, 60, and attacked her following an argument about a rake. He stabbed her in a frenzy more than 30 times. Chafer, now 57 and who had changed his surname to Leonard, was convicted earlier this month for attempted to murder. He told a court “a switch flicked in his head” and he hit her over the head and launched a “frenzied” knife attack. The pensioner survived but suffered life changing injuries. The fact Stephen Leonard and Stephen Chafer are the same man has not previously been reported. But Lorraine’s father Jim Holt, who was friends with Chafer, said the decision to release him had “destroyed a family”. Lorraine was out playing in the snow in the back garden of her family home in Sinfin Lane, Derby, on 20 January 1979 – but wandered off. Chafer, who was related to her through marriage, had been out drinking during the afternoon and came across her sitting in the snow crying while he was walking to their house. The then teenager gave Lorraine some sweets and carried her to the grounds of the local vicarage, where he put his hand over her mouth and sexually assaulted her before stabbing her 39 times. He later pleaded guilty to murder and was jailed, before being released 23 years later in 2002. More than 10 years later Chafer – by now known as Leonard – removed the fire alarms at his flat, part of a block of nine in Peterborough, and set it alight. He admitted arson with being reckless whether life would be endangered and was sentenced to 26 months in prison, but was released on licence on 9 August 2017. Then on 23 June 2018 he went to the home of Faye Mills, a 60-year-old woman with dementia whom he had known for about 15 years, in Peterborough. It was there that an argument over a garden rake “caused a flick of the switch in his head”, prosecutor Charles Falk told Cambridge Crown Court. He hit her over the head with the tool before grabbing a knife and stabbing her in a “frenzied” attack.